"Conundruminium" is part of a current series under development, whose working title is OVER-THE-SOFA SERIES, viewable here. View more portfolio images by linking on the titles below. Six artists - three from Deer Isle, ME, and three from Denver, CO - mounted a show at Edge Gallery in Denver's Navajo district during September 2013. We each incorporated repeated elements in our respective bodies of work. Then, in July 2014, we "re-iterated" the experience in an exchange of venue, wherein the Denver artists traveled to Deer Isle, and Gallery Mozelle hosted a show of the artists' new work employing the same theme/challenge. 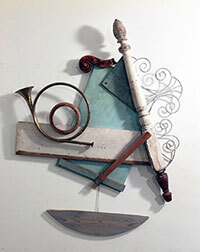 I was invited to exhibit at Regis University's O'Sullivan Gallery alongside printmaker, Jean Gumper. I 'occupied' the floor space by installing a group of nine curious free-standing sculptures. With this series, I attempted to really push the limits of balance within each piece, both visually and physically, creating a sense of precarious equilibrium. Each sculpture took on its own unique challenge and character, creating something like a gang of odd and quirky personalities. 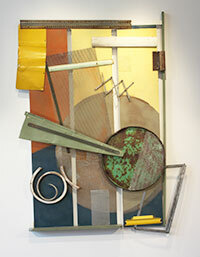 At Ice Cube Gallery in Denver (2012), I participated in a three-person show with two abstract-expressionist painters, Carol Browning and Karen Roehl. 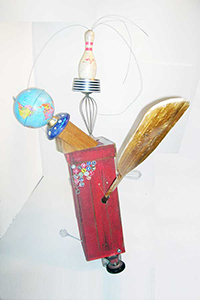 We collaborated on two pieces, and, for my part of the exhibit, I created a series of stupa-like assemblages constructed of odds and ends like cookie tins, Christmas tree stands, a wok, a thermos, wastebasket, and other everyday items. To involve the wider community, I issued a plea for any orphaned earrings to be contributed. 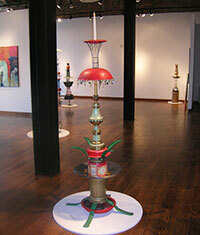 These offerings became part of several sculptures, including "Fringe Element", "Festivus Pole," and "Stanley's Cup." 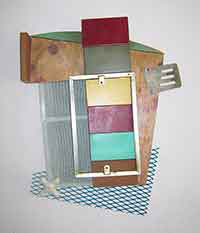 Also shown at Ice Cube Gallery (2010), The Way of Things collection was a series of mixed-media compositions that, for me, became weighty (literally) ruminations and mild musings on: the elegance of imperfection, incongruous harmonies, making do, letting go, letting be, impermanence, quirky connections, the poetry of rust, orphans of invention, happy accidents, intentional waywardness ... all in all, a meditation on the way of things.